Woodland Art, also known as Legend Painting or Medicine Painting, is a distinct style of native art that blends traditional legends and myths with contemporary mediums. It explores the relationships between people, animals, and plants and is rich with spiritual imagery and symbolism. With its bright colours, bold lines and 2-dimensional design, Woodland Art is one of the most recognizable forms of native art. The visionary style emphasizes heavy black form lines and x-ray views of colourful, figurative images. The perspective is strictly frontal, profile or aerial, lacking ground lines and indications of horizons. But don’t be deceived by its visual simplicity—the subjects and themes explored in Woodland paintings carry powerful meanings. Native symbolism is at the heart of Woodland Art, yet the mediums are anything but traditional. Woodland paintings are typically acrylic or watercolor paints on paper, canvas or wood panels. 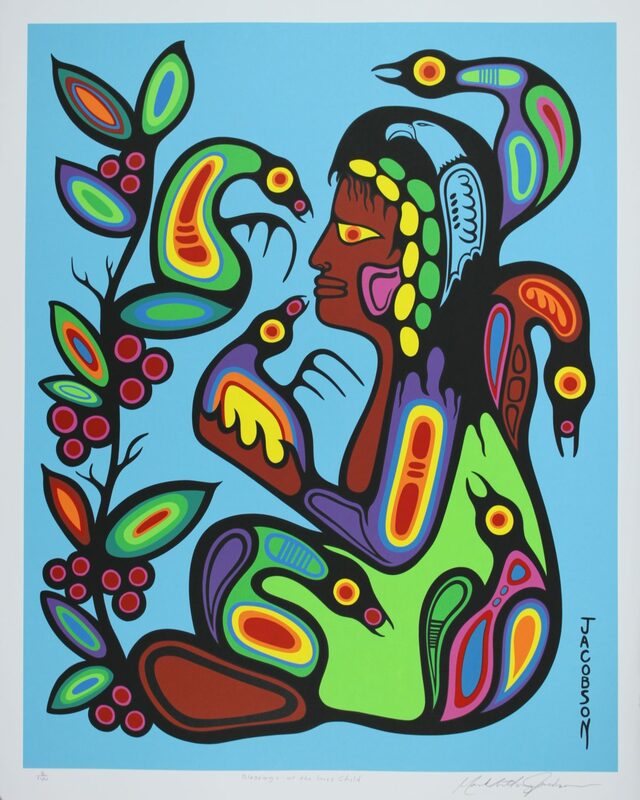 Norval Morrisseau, an Ojibway artist from Northern Ontario, is considered to be the founder of the Woodland School of Art. He was the first Ojibwa to break the tribal rules of setting down native legends in picture form and was originally criticized for disclosing traditional spiritual knowledge. However, his unique style gained traction in the late 1960s, revitalizing traditional Ahnisnabae icons and inspiring 3 generations of artists from northwestern Ontario, including Marc Anthony Jacobson, Roy Thomas, and John Laford.